I found this ages and then lost it. I think it looks quite cool. You can have a blog cloud too... 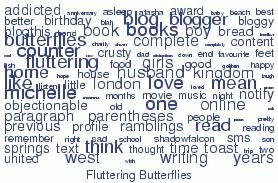 It's the words used most on my blog (I think). Or maybe just random words? I couldn't have used 'objectionable' THAT many times, right? King: Et cetera, et cetera, et cetera! I did that once and lost the place to find them. Yours is fun. I will have to do this. Pretty cool. I'll have to get my own! Any new keys yet?